I am joined here by Heidi, my parents’ dachshund. I love that dog! I was going to show this skirt for the “How I Wear My: Casual Party Outfit” post but have been so into my white jeans this summer that I decided to focus on them instead. 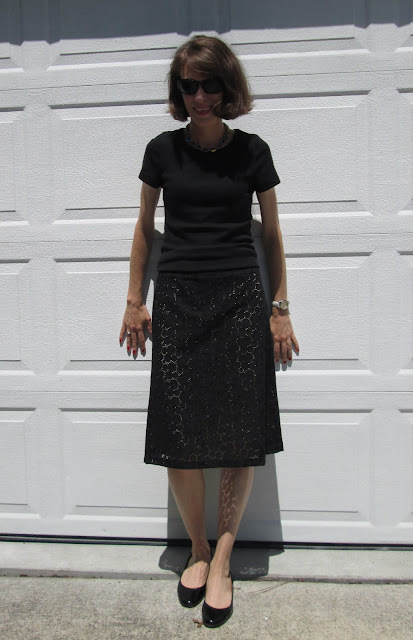 My friend Ana of Mrs. American Made asked if I would share pictures of my eyelet skirt since she has been doing some sewing this summer and I told her I had made it. Hey Ana, this post is for you! I have worn this outfit a few times, even to a child’s birthday party in July when I thought I better give my white jeans a rest. I have been seeing eyelet everywhere this summer, in skirts, dresses, and blouses and I still love it. I have a feeling it will be around next summer too. After my white jeans, this is my favorite outfit this summer. Shown here with a pale slip underneath. I specifically didn’t line the skirt so I could wear it with a pale slip. The wonderful Terri at RAGS Against the Machine sent me a gorgeous blue slip she thrifted to wear underneath the skirt and I love the effect. It can be hard to see in photographs but it is a lovely combination of black and blue, one of my favorites. Thank you, Terri! Under the eyelet is a blue slip, a gift from Terri of RAGS Against the Machine. 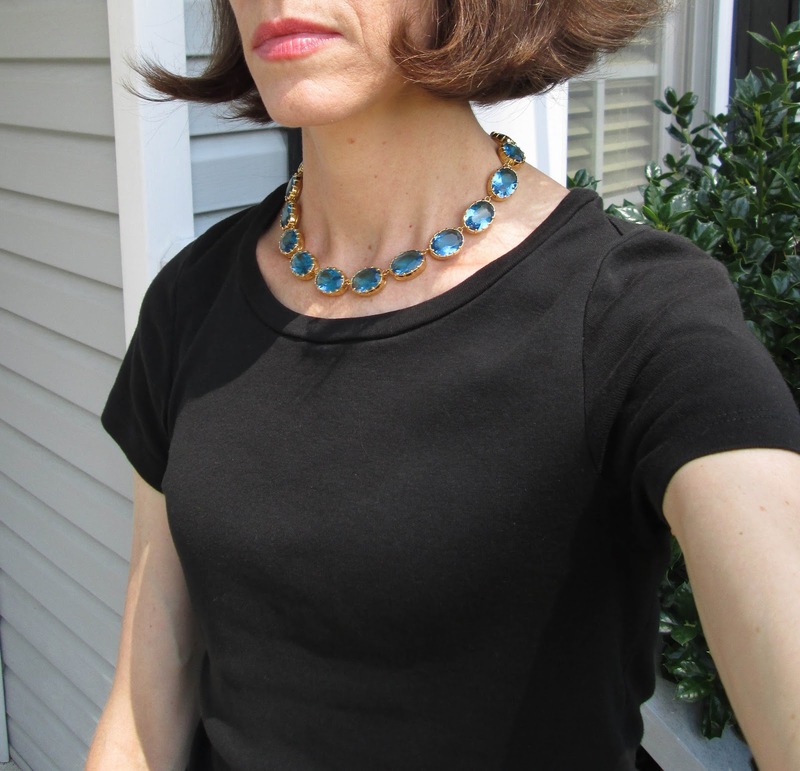 Oh do I love this necklace by my friend Nerida, who sells them at Duchessa Jewels. The necklace is by Nerida of Duchessa Jewels. My mother owns two of her necklaces and this London Blue Topaz is my favorite. Nerida, like me, was obsessed by Anna Wintour’s collet necklaces, took advantage of her location in Hong Kong to find a manufacturer to make similar ones (without that pesky thousands-of-dollars price tag that Anna’s cost, being original Georgian collet necklaces! 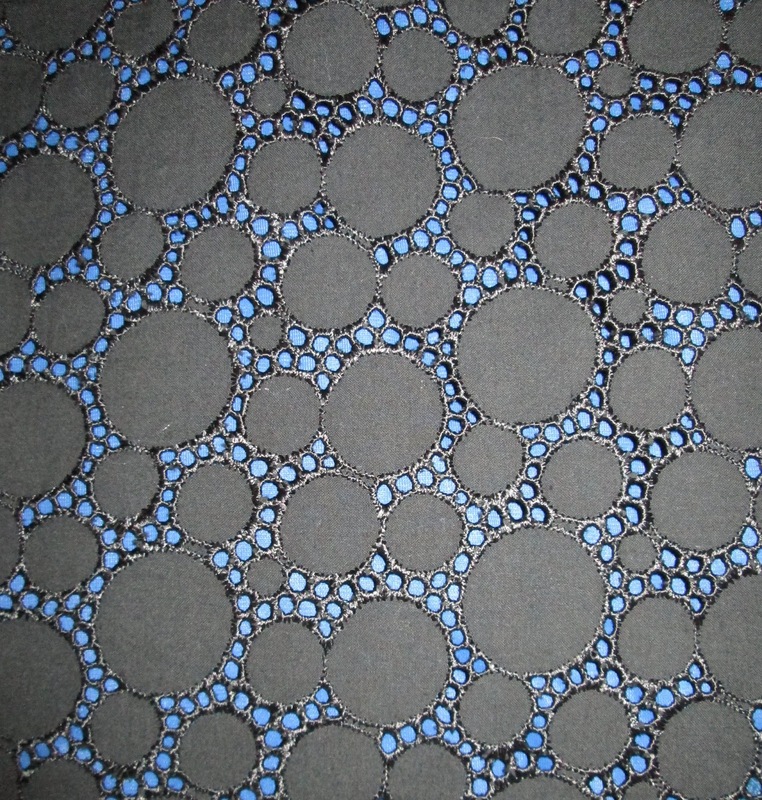 ), and sells them at Duchessa Jewels. Do pay her a visit, either at her jewelry site or her blog Art For Interiors. She has a great eye and loves pattern, bold color, and big jewelry! Gazing off into the middle distance, Heidi is ready for her close up! 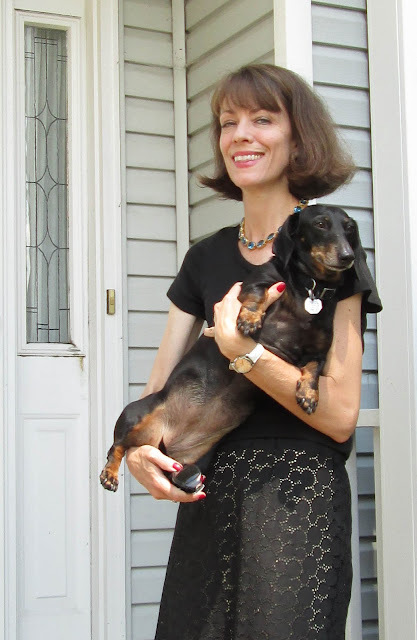 Since I was wearing all black, it seemed appropriate that Heidi, my parents’ dachshund, got into the pictures with me. With her silky black coat with touches of bronze, her penchant for barbecue (bits of which I feed her on the sly) and getting into trouble, this is a dog after my own heart. Have you been wearing eyelet this summer? Or big sparkly necklaces? Do you love a dachshund like I do? I LOVE the eyelet skirt you made and the idea of wearing different colored slips underneath to change the look is so smart! Heidi is quite adorable too! Jill you look the epitome of stylish chic in your chosen outfit. I am happy to know I am not alone in being heartfully committed to particular pieces at a time. I enjoy trying and reworking a piece to not only challenge myself... but to work it to the best effect for my body type. I have so enjoyed all of your effort on How I Wear My... I am excited to see all the looks for September's neon. You are the perfect model for that very chic outfit ! What a gorgeous skirt, Jill. I remember when you started making it. You will have that in your wardrobe for many, many years to come. So funny that you mention Anna Wintour and her necklace's because I was thinking you reminded me of her here and then you bring her up!!! Such a pretty skirt! And I'll bet it's cool and airy for summertime wear too. Jill, you are completely, tres, french chic. Love it! Had our first dachshund, Inch, when I was very little girl. Five decades later, we had Sebastian who was a rescue. Miss them both! Lovely all around, that outfit. Great idea to vary what is worn underneath. Straight slips are easy to make ... you could have a color wardrobe! Good to see you at Visible Monday. A pleasure. I remember when you were first cutting the eyelet to make the skirt! It turned out great and the contrasting blue slip underneath is lovely. What a cutie your parents dog is. Dachshunds are lovely dogs. I am also leaving a comment here - the skirt is beautiful! I really love it and the idea of making so you can wear a color under it is brilliant. 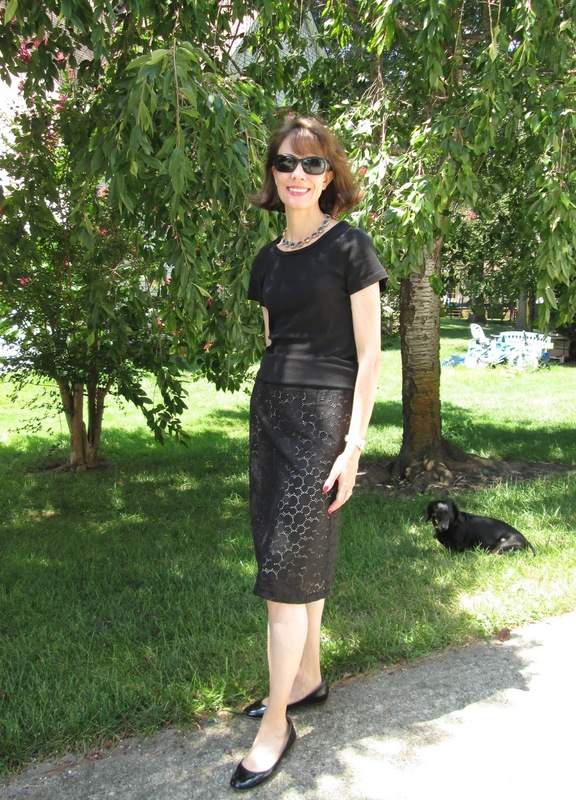 Jill, I think this is my favorite outfit of yours- I love it and it looks so classic and chic on you! That skirt is a charmer as is your little weiner (heh heh!) And the fact you're pals with Ana (cuz she soooo ROCKS!!!) makes me a happy puppy! I love the necklace. It is simple but is really attractive. And it is really the perfect accessory for your eyelet skirt.